Today faster connections well over 100Mbps are becoming more common, and end users expect to test they are receiving the amount of speed they are paying for. When testing a connection faster that 100Mbps you may be surprised that accurate internet speed testing can be limited or affected by several factors. 7. Other bandwidth traversing in/out from your networking to the internet needs to be factored into the math. For example, on a 100Mbps/100Mbps circuit and test your current usage lets say is about 20/50, your speed should reflect about 80/50. 8. Testing server speed limitations – Because testing servers are free, some companies do not like to pay for upgraded networks, servers and maintenance or additional bandwidth and so they limit the bandwidth for example to 50Mbps or 100Mbps. This bandwidth pipe will be shared across all network tests hitting that server at the same time, and that can be hundreds or thousands of simultaneous tests at one time. 9. Testing server test limitations – In most cases the testing servers are just not capable of testing speeds over 100Mbps per connection or test and when multiple tests are being run. The testing server or network is not capable of sustaining the many concurrent testing requests. 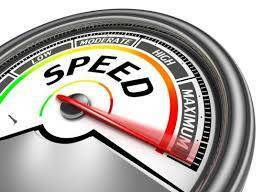 If you try internet speed testing using different speed testing systems, you will notice inconsistent results. This can be due to the current testing server load or software, geographical location of the server or network configurations may be different from the other servers.